This premium quality sleeved Q-Connect plastic eraser erases graphite from paper without tearing or smudging for smooth and simple correction. 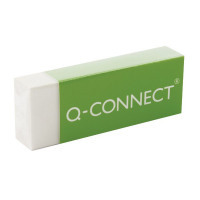 Ideal for schools, offices and the home, each eraser measures W60 x D22 x H11mm. This bulk pack contains 20 erasers.